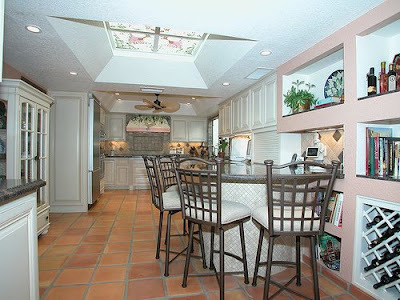 For the kitchen/first floor rehab, I am strongly leaning towards Saltillo tile for the flooring. The Husband is less inclined; I have little idea as to why, but he is not gung-ho about the Saltillo. My argument is (1) he says he hates ceramic/porcelain tile, so Saltillo is a natural stone, should be more acceptable to him, (2) he says Saltillo is better for outdoors, and my response is that is it is for both indoors and outdoors and has been used for both for many years, and (3) the exterior of our house is Spanish style, so Saltillo is a good match. 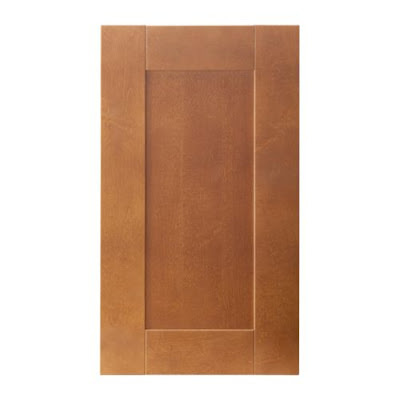 If it isn't too annoying to install (and not cost prohibitive), I'd like to do little 2-inch inlay accent tiles with something like the tile below. I love the whole turquoise and red clay combination. The store that carries this little tile has so many beautiful designs, and turns out it's only an hour drive from our house. They are not cheap, though. Eh. Several other things need to be decided. One is the living/dining room flooring. Yet another complaint from the husband is that tile throughout the first floor is too much. I'm quite ok with it just because it's easier to clean and is durable. But, because I try to keep an open mind and be diplomatic, I am thinking we could doing some hardwood in that area, but using a high quality click-together hardwood (not laminate!) that we can install easily, like this stuff, and then upstairs will eventually match with the same wood (maybe not click together, there, but nail-down since the sub-floor is plywood and not concrete slab). The other, more pressing decision, is the CABINET. I would have been find with white, but this is yet another area of Husband veto. He doesn't want white cabinets. 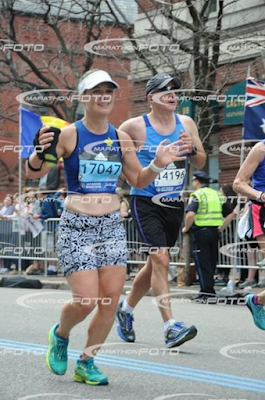 I am lucky that I am so flexible in my tastes or else nothing would ever get done. 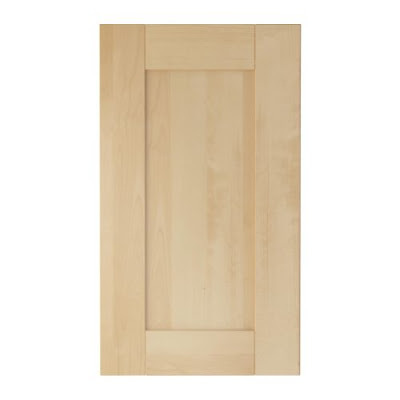 I am leaning towards IKEA's Adel and I think The Husband will be OK with it since it's nice solid birch and feels like a sturdy door. When we checked it out at IKEA he seemed like he liked it or at least would allow his arm to be twisted into agreeing to it. Adel comes in several colors but I am looking at two of them, light birch and medium brown. I had been pretty firm on the light birch as a nice contrast to the clay tile color, but now I am looking at the medium brown thinking that could look nice with the saltillo as well. Not sure anymore which to choose. 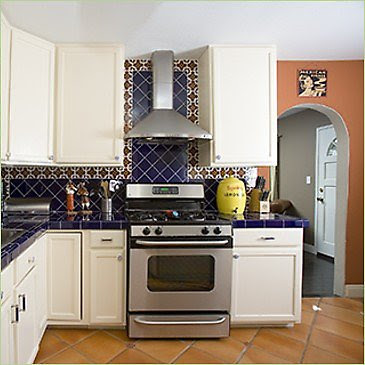 I think the tile is great for the kitchen, especially since you want to incorporate the Spanish theme! As far as the rest of the downstairs goes, I think tile in a living room makes it look a bit cold. Wood is a great alternative. It mixes textures while keeping with the same theme but doesn't go overboard with either. I really like the saltillo. I agree with girly stuff - I prefer the darker cabinets, but against the tile, they may be too dark and the light may look better. Don't worry - my husband needs to have input on every little thing as well - drives me bonkers sometimes! We have saltillo tiles through out our home. 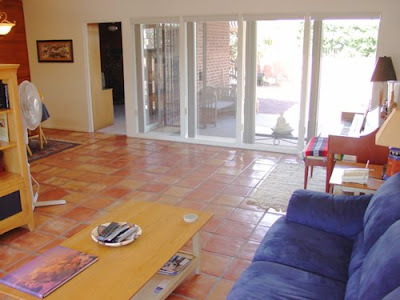 We placed Persian area rugs in the living room, dining room and family room to soften the look. Our kitchen cabinets are light wood and they contrast well with the tiles. 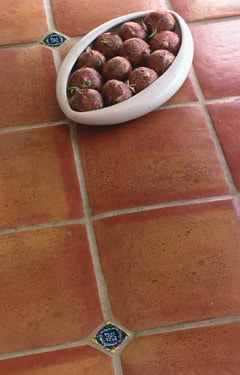 Our dilemma is how to safely clean and buff the tile floors. We bought the house 2 yrs ago and the tiles are 11 yrs old. They are in excellent condition. We prefer a chemical free product to clean and shine them.